Embonas (Emponas) Embonas (also: Emponas or Embona) is the most important grape-producing village on Rhodes. Come around harvest time, and you will find the streets being full of baskets and the courtyards being spread with raisins soaking up the sun. When you approach the walls of the Old Town of Rhodes, you are about to enter the oldest inhabited medieval town in Europe. 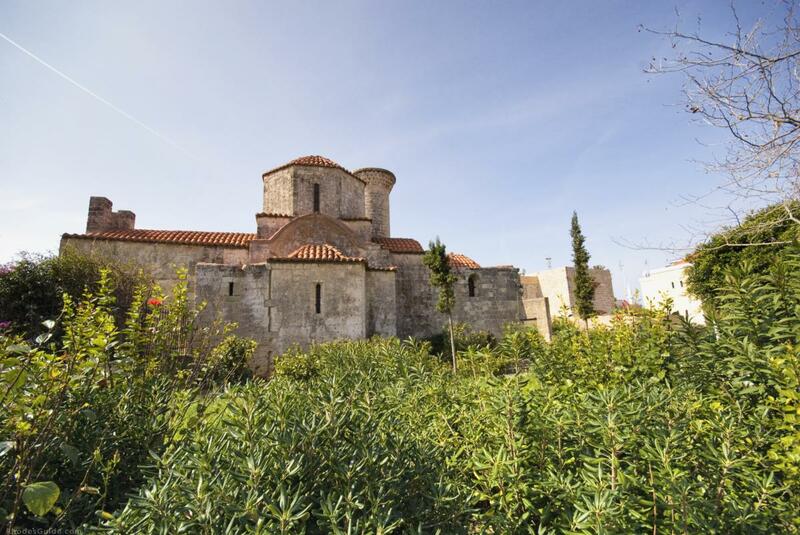 In the Medieval Town of Rhodes (or Old Town) you may for sure enjoy one of the most interesting walks on the island. Do not be misled by the term "medieval" into thinking that what you will see is a ruined and deserted city. It is a bustling neighborhood of some 6000 people, who live and work in the same buildings in which the Knights of St. John lived six centuries ago. It's a thrill to behold. In the Medieval Town of Rhodes (or Old Town) you may for sure enjoy one of the most interesting walks on the island. Do not be misled by the term "medieval" into thinking that what you will see is a ruined and deserted city. When you approach the walls of the Old Town of Rhodes, you are about to enter the oldest inhabited medieval town in Europe. A bustling neighborhood of some 6000 people, who live and work in the same buildings in which the Knights of St. John lived six centuries ago. It's a thrill to behold. Medieval buildings, mosques, traditional fountains, oriental motifs, Byzantine and Gothic churches, shops and cafeterias are scattered throughout the Old Town of Rhodes, all blending together to create a unique and picturesque whole. There are roughly 200 streets or lanes that simply have no name. Getting lost here is not a defeat; it's an opportunity. Whenever you feel the need to find your bearings, you can ask for Sokratous street, which is the closest the Medieval City comes to having a main street. The Palace of the Grand Masters, reconstructed by the Italians in 1940 after it was demolished by a gunpowder explosion in 1856, stands out because of its imposing entrance and well built towers and battlements. The interiors of the buildings, decorated with priceless treasures, are equally impressive. 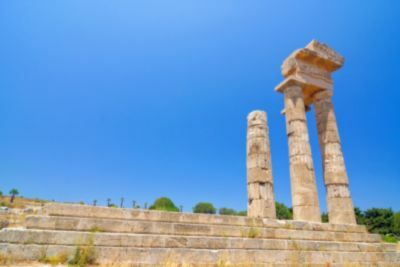 Looking for things to do in Rhodes? Don't miss out on great experiences! Check out the following offers for things to do and activities in Rhodes! Looking for a hotel on Rhodes? Hey! we got some hot rental deals for your vacation! Check the following deals and special offers for hotels on Rhodes! 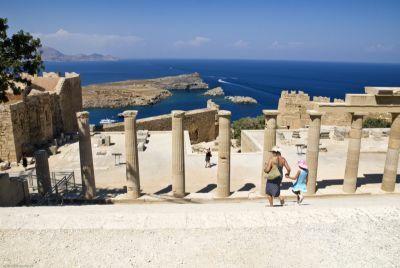 Lindos is for most visitors the most impressive archaeological site on Rhodes. 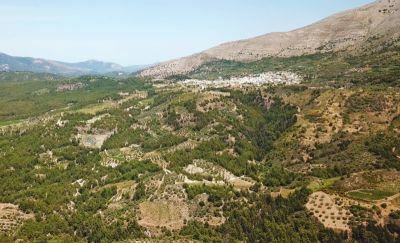 The dramatic natural landscape is enhanced by the picturesque quality of the more modern town, with the Lindos Acropolis rising dominantly on a steep cliff at 116 m height like a sovereign podium overlooking the sea, framed by mighty fortress walls. 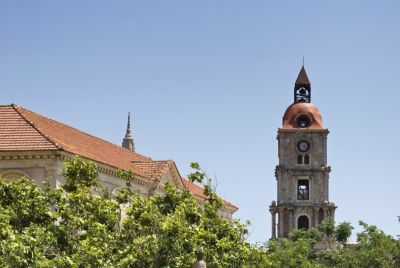 Even being the highest elevation of the Old Town of Rhodes, the clock tower (Roloi), is hardly noticeable at first glance.